We're really excited to see the progress made by Big Brothers Big Sisters of Puget Sound, a wonderful, established organization which has really made a big effort over the past year-plus to reach out to Latino kids and enhance its program to include "Bigs" that are more representative of our actual community. This evening they're celebrating the Latino Mentoring Advisory Committee and we're looking forward to hearing from Ceci Lusardi, the Associate Director for Hispanic Mentoring of Big Brothers Big Sisters of America. We encourage Latinos and other community members to get to know the Big Brothers Big Sisters of Puget Sound organization, and get involved to help give our local kids a great start! Those who know me know I'm a stickler on this subject! A new coalition, Consumers Against Auto Fraud, is addressing some of the problems that may arise during a used car purchase. Now we need your help in making the used car buying process more transparent and fair for consumers across the state. The legislature is considering a pair of bills that if passed will positively impact many low-income Washington consumers: SB 5675 sponsored by Senator Ed Murray and HB 1772 sponsored by Representative Brendan Williams. Links to both bills are attached below. (1) All used car dealers must inspect their cars and disclose significant known defects to consumers before purchase. (2) If the used car dealer negotiates the deal in a language other than English then all vital documents must also be translated into that language for the consumer. (3) The bond that car dealers must post to protect consumers from unscrupulous and fraudulent practices is increased. (4) Certain misrepresentations during the sales and financing process are explicitly prohibited. To find your legislative district go to http://apps.leg.wa.gov/DistrictFinder/Default.aspx . 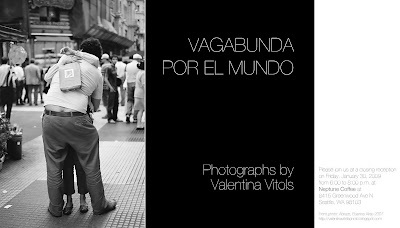 Valentina Vitols, a supreme photographer and lovely lady from Venezuela, is celebrating the closing reception of her showing, Vagabunda por el Mundo. She's got a cool SODO studio and a wonderful spirit! For more info on Valentina and her art, visit her site. ENGLISH to Become Washington State's Official Language? I realize this is a very controversial issue, but let it be known that our legislators are trying to make English Washington's official language. What does that mean? In effect, it means that any and all government agency documents need only be produced in English. Before you start your comments that this is America, we speak English here, please put yourself in the place of a recent immigrant, one of many hundreds of thousands, in a country where English is *not* spoken. Language learning requires much time--many years, for some--but in the meantime should you be cut off from services? The entire bill language follows. 2 the state; and adding a new section to chapter 1.20 RCW. 9 official public record and any official public meeting. 15 under chapter 42.30 RCW. 26 their continuation and expansion. 30 persons or circumstances is not affected. Here's your opportunity to have a voice on SB 5589: the future of the Washington State Commission on Hispanic Affairs and other ethnic commissions in our state. What the bill is proposing is for all ethnic commissions to be dissolved and an over-arching Minority Affairs Department be established. While a considerable cost saving measure is realized, it would significantly reduce access to all communities of color currently served. PASS THIS ALONG: If you or others can attend the hearing it would bode well for all of our commissions in the state. And if you cannot attend: I encourage you to CALL and voice your position! There's an opportunity for great Spanish wine tasting at Gaudí Restaurant, this Sunday starting at 5pm! There will be 6 wines from different regions of Spain for tasting and for sale by bottle or case. And of course Juan’s tasty food to pair with them. The cost per person is $30.00 plus tax & gratuity, to reserve a place or places please call 206 527-3400. ...because over the years they have been very generous to the cultural arts community. Funny, I was just reading an article in yesterday's Los Tiempos newspaper from Cochabamba, Bolivia, on the issue of indigenous immigrants in Skagit County and through the U.S. Today, that story's featured in our own Seattle Times. Like others from Mexico and Central America, the indigenous have come to the U.S. looking for a better life. Many end up as farmworkers, right here in our own Skagit County. Thing is, they're being told that they're "Latinos" and "Mexicans," - even those from Guatemala! Members of these indigenous are of an entirely different culture. Many don't even speak Spanish (instead, they speak their indigenous dialect) and don't come from a Latino culture. The U.S. Census groups them as Native Americans and Alaskan Natives. An interesting title for a wonderful effort around financial aid for college! This is a free workshop at Seattle Central Community College providing on-site professional assistance to students and families applying for financial aid for college. Volunteers speak several languages; parents with limited English are encouraged to attend with prospective students. WHEN: Sunday, January 25, 2009, 2:00-4:00 p.m. COST: Free of charge and open to the public; no registration is required. BACKGROUND: In one day, students and their families will learn how to get money for college. College Goal Sunday is a free program that helps students and their parents or guardians fill out the Free Application for Federal Student Aid (FAFSA). Students and their families can attend College Goal Sunday at a variety of locations across Washington State in January and February. For more details about College Goal Sunday Washington, the FAFSA, locations or what to bring, visit http://www.collegegoalsundaywa.org/ or call 888-758-2253. For further information about the event at Seattle Central Community College, call Brigid McDevitt, Dean of Student Resources, at (206) 587-6314. We're here in the office, enjoying some of Anna's Almond Cinnamon Thins (Delgaditas sabor canela y almendra) and noticed something interesting! And as all Spanish speakers will realize from this example, this is why you should never, ever use an Internet translation or count on anything less than a native Speaker and professional translator for your packaging and other business communications. This just in: This year's Miss Quince and Latin Bridal Expo and Latino Business, Consumer and Career Expo are now one! Based on the current economy the team at Expo NW thought it best to combine the two events into one on either side of the mountains. The two areas will be clearly delineated to help direct attendees to the areas they're interested in, so job-seekers won't have to try on bridal gowns, and 15-year-olds won't have to bring resumes. Last year's events were fairly well attended and they're headed for growth! For more information on these opportunities, please visit the Expo NW website. Join community leaders and advocates in presenting a united voice in support of issues that affect the Latino community for the 2009 Legislative Session. WHEN? March 13, 2009, 10:00 a.m. - 4 p.m. The event will also feature tours of the state Capitol, community agency exhibits, and entertainment. Hello - I want to share this article on Newsweek regarding the Boy Scouts of America and steps they're taking to genuinely recruit Latinos. 1) The reminder that 1 in 4 U.S. residents will be Latino by 2050. 2) The statistic that the Hispanic births/deaths ratio is 10 to 1. The general population ratio is 1/1. Translations alone won't help them meet their recruitment goals. They've learned to explain what Scouting is all about and define the term. They've also learned to *not* wear the uniforms the first time they approach Latino families, because previously parents saw this as a military uniform. This is one of those barriers *no* translation would transcend! Listen to today's podcast on La Curaçao and other retail companies that are keenly aware of the importance of embracing Latinos with carefully planned touch-points that resonate most with the Hispanic consumer. Click here to read more and hear podcast. Our friend and colleague, Beto Yarce, has a terrific business based in Pike Place Market. Have you been to Cintli? Check it out sometime, downstairs from Rachel the Pig. We are frequent customers because his designs and selection are quite unique! Well now Beto has become even more involved with an organization close to his heart: Washington CASH. By working with this organization Beto's helping others achieve their dreams of business ownership and success. Now he's been named Latino Community Based Business Trainer. Congratulations to Beto, and enhorabuena to the people he's going to help in this new post! See the latest on Beto's new responsibilities with the organization at the Washington CASH website. Also, check out his artistry at Cintli or right in our own Market. I visited Caoba Salon on Saturday for their Grand Opening. This is one classy place! The owners, Jack Gamero (of the Lake City Way Caoba Salon), Mauricio Ayón and Jaime Méndez, have created an ambience much like the original Caoba Salon right in La Plaza Shopping Center in Kent-Des Moines. It's a terrific brand--these guys are really onto something! Caoba Salon is spacious and beautifully decorated. They have private rooms for waxing, facials and massage. A really nice ambience. Jessica, the technician who performed my waxing service, was professional and caring--and we laughed a lot! Surprisingly, however, Jessica does not speak Spanish, so I'm hoping others they're bringing in will be able to converse with Latino clients in Spanish. Unfortunately, I had another engagement so had to take off before the real party began, but I can tell you that this business is poised for big success. Readers: If you've visited Caoba Salon during the Grand Opening or anytime in the future, feel free to comment with your experiences. Congrats to Mauricio, Jaime and Jack on opening their new salon! We wish you the best of success! Hello - a reporter from Hispanic Career World, Lois Vidavre, is seeking MBAs working in Banking/Finance in companies of 3,000+. "As a writer for Hispanic Career World, I am looking to interview two Hispanics working in the banking/finance world for companieswith more than 3,000 employees and who have their MBAs. Themagazine can be viewed at www.eop.com. I will e-mail 12 questions asking the interviewee to share their own career journey. I can be reached via e-mail"
This is a great opportunity to share your success story and inspire others! If you fit the bill, email loismaevid@yahoo.com. If you know someone who might be interested, please share this post! Deadline is 3pm PST January 13. A NW visit from legendary Cuban poet José Kozer! Join an intimate workshop with José Kozer during his visit to Seattle. The event will take place on February 3rd from 7-10 PM in North Seattle. Space is very limited (15 people maximum) so sign up asap by emailing info@houseofwriters.com. Suggested donation is $50. This event is sponsored by 4Culture, the City of Seattle Neighborhood Programs, and House of Writers. Cuban Poet José Kozer Comes to Town! Join an intimate workshop in Seattle with José Kozer during his visit to Seattle! The event will take place on February 3 from 7-10pm in North Seattle. Suggested donation is $50. 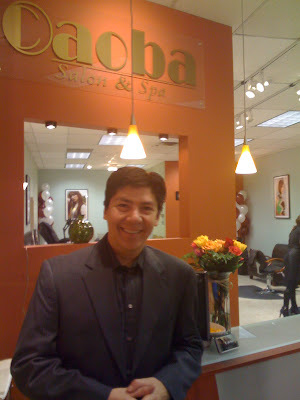 Caoba Salon is now open in the La Plaza Shopping Center in Kent at 23229 Pacific Highway S. (Pac. Highway S& Kent-Des Moines Rd). Phone is (206) 824-1434. This is another venture by the team from Nuevodirectorio.com--Jaime Méndez (yes the Univisión newscaster/Ke Buena DJ!) and our friend Mauricio Ayón, as well as Jack Gamero, seasoned stylist. Come and check out the new salon at its Grand Opening event this Saturday, January 10th from noon until around 7 pm. The Caoba Salon team invites you to come by (bring a guest!) and say "hello," have a drink and eat some hors d'oeuvres with them! Enhorabuena, Mauricio, Jaime and Jack! Here's an excellent opportunity for Latino students to talk to employers who are looking to great employees who happen to be a minority. And if you're an employer who would like to see your staff be more representative, this is your opportunity! If you are seeking top-notched diversity candidates for career, internships or Co-op positions then you don't want to miss this event. Last year's career fair attracted approximately 2500 students and more than 140 employers representing a broad range of employment sectors including: airlines, aerospace, financial services, various engineering, education, consulting, health care, retail, manufacturing, government and non-profit.